Adaptil spray (previously known as D.A.P.) has a calming effect on anxious and restless dogs in specific environments such as kennels and crates. When anxious or restless, dogs can exhibit unwanted behaviours. Some examples of anxious or stress-related behaviour includes: excessive barking, crying, licking, uncleanliness and destructiveness. This can be annoying for both you and your dog. Fortunately, Adaptil has the solution! When puppies are born and begin to drink milk from their mother, natural pheromones are released. Whilst these cannot be detected by humans, these pheromones actually have a calming effect on puppies and they make sure that the puppies feel at ease when their mother is nearby. Research has shown that dogs are also susceptible to these pheromones at a later age, and can also be reassured in a similar way. Adaptil products, except tablets, contain a copy of these pheromones. 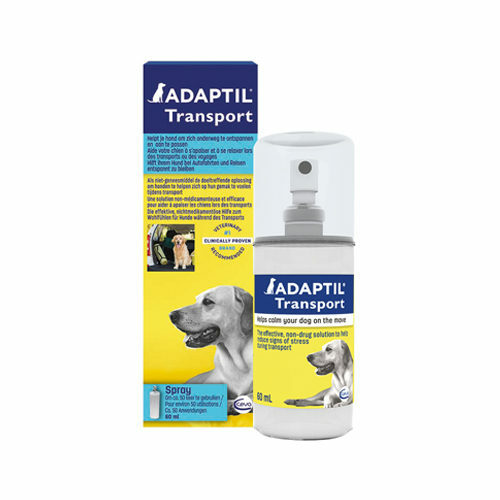 Adaptil spray is an ideal product for specific, often localised, behaviour problems in dogs, including crate or pet carrier anxiety, fear of travel or motion sickness. Adaptil spray also perfectly complements the Adaptil diffuser for use whilst travelling. You can also use the spray to give specific environments, such as the (travel) bag or crate, the scent of pheromones. Adaptil spray can also help dogs with fear of travel or motion sickness. Dogs with motion sickness often associate their nausea with the car, so the car itself has become an object of anxiety. In order to deal with motion sickness you can, with the help of the Adaptil, spray the car in order to make it a comfortable place again. It may also help to use motion sickness medication and drive slowly to reduce the dog's anxiety. It is recommended that this product is used for 3 to 4 weeks for optimal results. In addition to the spray, Adaptil is also available in the forms of the Adaptil dog collar, Adaptil diffuser, and Adaptil tablets. Below you can see which product is best to use in what situation. Have you used Adaptil Spray (DAP) before? Let us know what you think about this product. This has had a dramatically good effect on our dogs. Both are terrors and can be highly strung, we travelled to France recently and with this spray they were both settled in no time and for a considerable period. Highly recommend this product.